This is not your brother-in-law’s riding mower. The Kubota company has been in business for over 100 years. Kubota lawn tractors are legendary for their performance and design, and are considered among the the best machines available anywhere. For reliability and pure performance, these machines are very hard to beat. The Kubota lawn tractor lineup is not extensive. A few basic models designed to meet the day to day needs of a demanding consumer seems to be the philosophy of this company. This is also reflected in the down to earth design of the equipment produced - simple, reliable, and durable. Although Kubota is a Japan based company, they have started manufacturing several of their lawn tractors here in the United States. Check with your local dealer to find out where your particular model was made. A variety of engines are also manufactured in the U.S.A., for use in power equipment in a variety of applications by other manufacturers. All the Kubota lawn tractors feature rear bagging as an option. The deck cutting height is adjusted manually using a dial gauge. The front axles on all Kubota tractors is fabricated of cast iron (would you expect anything less?). This is the sturdiest material available for a lawn tractor front axle. The deck design on all the Kubota lawn tractors feature the ‘step through’ design. This eliminates any obstructions in front of the drivers seat. This allows for easy entry and exit from the tractor without the need to lift feet and legs over a raised portion of the frame. 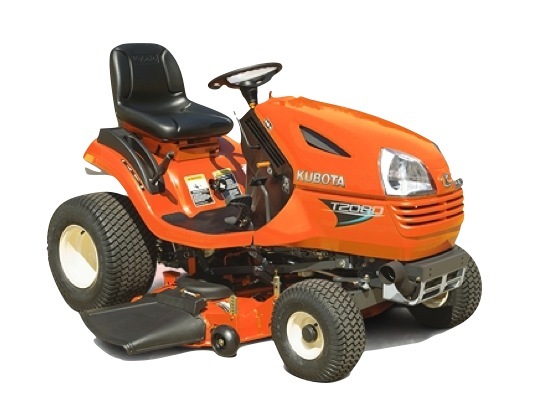 Kubota lawn tractors are available in three model series - the T; GR; and G. The T models are considered the lower end in price and features, and are followed by the GR and G series in cost and available engine power. There are three T models available, two models in the GR series, and three models of the G series. The T series offers a choice between a single cylinder Kohler overhead valve ( OHV) single cylinder 18 HP engine model T1880, or a Kohler twin cylinder over head valve engine, rated at 20 HP (model T2080) or 23 HP (model T2380). All versions of the engine feature a pressurized oil system, with a replaceable oil filter. All the T models have a manual PTO used to engage the cutting blades. Every model has a 2 blade cutting deck - either 42” or 48” width. Models T1880 and T2080 come equipped with the 42” deck, model T2380 features the wider 48” deck. Count on spending between $3350.00 to $4850.00 for the tractors in the T series. The GR series offers a choice between a Kohler twin cylinder over head valve engine, rated at 20 HP (model GR2010G-48) or 21 HP three cylinder liquid cooled diesel engine (model GR2110-48 and GR2110-54 ). All the engines feature a pressurized oil system, with a replaceable oil filter. Both the GR models have a mechanical wet multi disc clutch used to engage the cutting blades. What exactly does this mean? Suffice it to say it is light years ahead of any other system used as a PTO on practically any other lawn tractor. The deck has a ‘Quick Attach’ feature that makes removal a snap. Every GR model has a three blade cutting deck - either 48” or 54” width. As an added bonus, hydrostatic power steering comes standard! This type of luxury and performance does not come cheap. The GR series will cost about $7850.00 to $8700.00. Ah, but we can always dream, can’t we? Next is the G series , which sports either a three cylinder 24 HP gasoline engine (model G460G-60) or 21 HP three cylinder liquid cooled diesel engine (model G2160-60 and others, depending on deck width). All the engines feature a pressurized oil system, with a replaceable oil filter. The deck has a ‘Quick Attach’ feature that makes removal a snap. Cutting widths available vary from a generous 48”, to an expansive 54”, to an unbelievable 60”. The hydrostatic transmission has direct shaft drive from the powerful engine options. Electronic rack-and-pinion power steering is another exiting feature on this sweet machine. If you have to ask how much this will set you back, you probably can’t afford to drive this work horse around the spread. Consider some serious long term financing, for the price range of $8300.00 to $9200.00. If you are looking for one of the best lawn tractors available, and price is not a major consideration, consider Kubota.